Roses and a fountain on the terrace of Bowood House in Wiltshire. At last year’s RHS Chelsea Flower Show, one of the key themes was the impact gardens can have on your health and wellbeing. The verdict? Gardens are good for you. Whether you partake in gardening yourself, or simply enjoy being amid lush greenery and vibrant oral displays, there is growing evidence that gardens make us feel better. With this in mind, we’ve found some of the best hotels with gardens, from grand estates to more intimate sanctuaries, to make your next stay a relaxing and uplifting affair. Roman philosopher Cicero is once said to have remarked: “If you have a garden and a library, you have everything you need”, so guests at Bowood Hotel, Spa & Golf Resort, Wiltshire, must feel very content indeed, as the elegant hotel has both. Set within 100 acres of Lancelot ‘Capability’ Brown parkland, where sweeping lawns lead down to a serpentine lake, it’s a stunning place to wander. 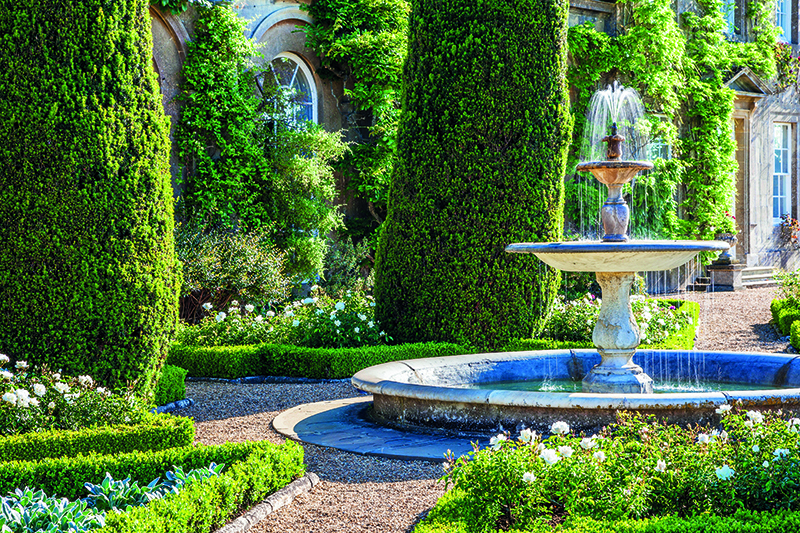 A pleasant amble from the hotel will bring you to Bowood House – still home to the Marquis and Marchioness, owners of the estate – which guests can look inside, though the real treasures are to be found outside, in the Italian terraced garden or the private walled garden. The latter is a secret enclosure, with entry restricted to monthly tours, but it’s worth the wait: tulips, roses, lavender, peonies, hydrangeas and honeysuckle all vie for your attention. There’s also a wonderful adventure playground for kids within Bowood’s grounds. Bowood is well placed for visiting Avebury – a Neolithic stone circle that rivals Stonehenge – the city of Bath, or the chocolate-box village of Lacock. 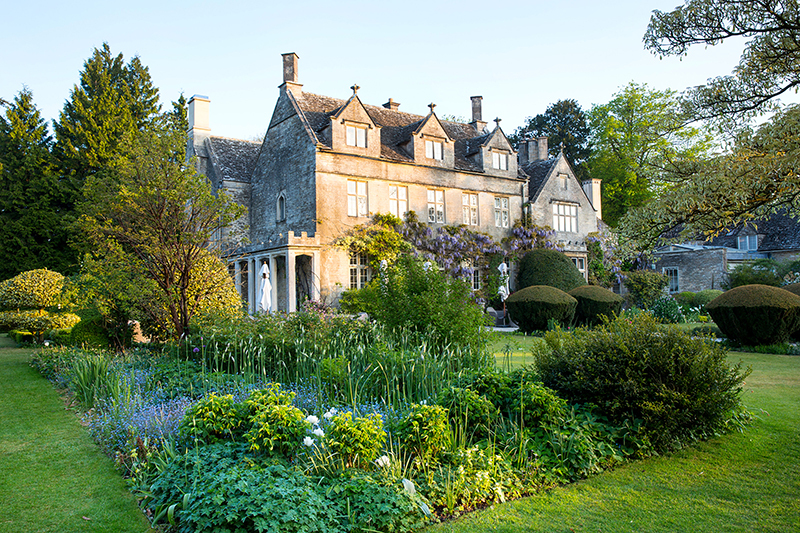 Just 30 miles north of Bowood is Barnsley House, Cirencester, in the Cotswolds – a lovely example of a hotel and garden that seem to blend seamlessly with each other. The gardens were designed in the 1950s by the doyenne of the English country garden, Rosemary Verey, who went on to design the New York Botanical Garden, as well as work on gardens for everyone from Prince Charles to Sir Elton John. 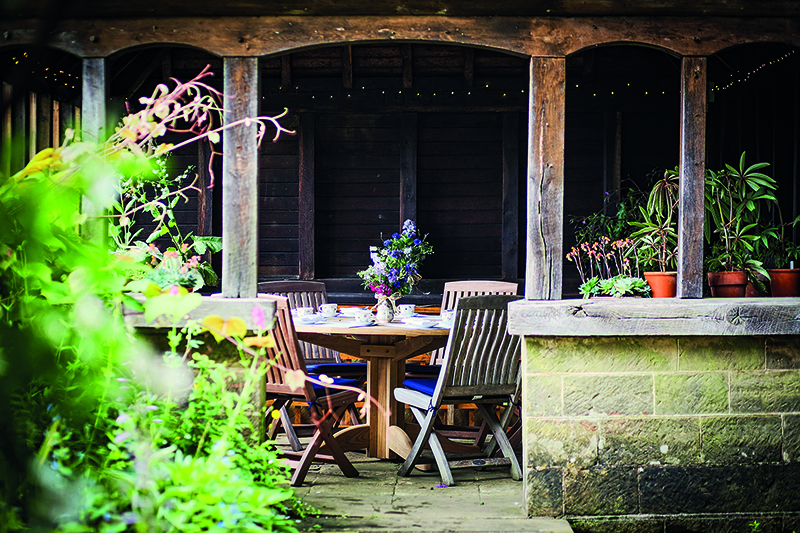 Foliage frames the 17th-century Cotswold stone of the hotel beautifully, with its creeper-clad facade, knot garden, lily pond and colourful herbaceous borders within a most picturesque English setting. Inside, rooms are luxurious and romantic, dressed in creams, pastel pink and soft greys. Several rooms overlook the gardens but for a truly revitalising stay, book into the Secret Garden Suite, where doors open onto your own terraced hideaway.